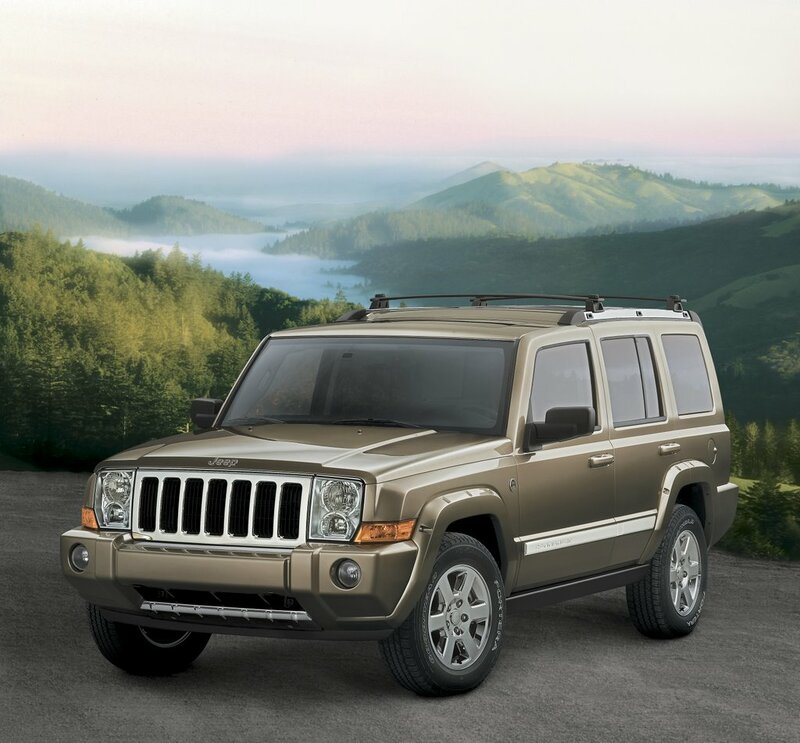 Here we have the 2006 Commander, which looks an awful lot like the rough-and-ready Jeep your granddaddy drove back in the days long before fast food became America’s favorite way to spread clogged arteries. In fact, this all-new Jeep is a whole lot more like the old one than that favorite cheeseburger and fries are like real food. The seven-slot grille and faux exposed-head screws around the fender wells provide the appropriate design cues. You wouldn’t know it gazing at the Commander’s severely blocky exterior shape that it shares the same platform as Jeep’s perennial favorite, the Grand Cherokee. The two vehicles share lots of mechanicals, but the Commander has a longer wheelbase, which makes it possible to stuff a third row of seats out back. Grand Cherokees only come with two rows of seats. There are three engine choices, including 235 horsepower 4.7 liter V-8 powering my Deep Beryl Green Pearl/Khaki Graystone tester, a big mountain motor Hemi and a base V-6. A five-speed automatic is the only available transmission, but there are three four-wheel-drive choices. Inside the Commander are generous accommodations for the first two rows of seats, but that third row is hard to get to and not particularly comfortable. The third row of a Dodge Grand Caravan is far more inviting and useful. The instrument panel is much like the exterior in featuring lots of straight lines and absolutely upright surfaces. The front seats are nicely padded and there is a pleasantly secure feel to the cabin. I loved the saddle brown leather as it made me want to find a campfire and start telling stories of the Ole West. Well, for a few seconds, it did. Anyway, on the road, Commander has rather numb steering and a bit of ponderousness to its around-town moves. The 4.7 liter V-8 provides adequate power and typical – i.e. rotten – fuel economy. That said, however, on the interstate, the Commander is a smooth, quiet operator. The tall greenhouse and stadium seating make the Commander ideal for taking friends and family on a scenic tour of, say, the mountains of far western Maryland at the height of the fall leaf season. My Commander Limited 4X4 tester was liberally equipped, with just about every option available short of the Hemi. At $41,530, the high-line Commander is a bit pricey, but Jeep fans tend to be extremely loyal. I think they’re gong to like this one. WAnt to Talk to a Lexus Executive?